Israel plans to build 740 new homes in settlements in occupied East Jerusalem, a minister said, despite its commitment to freeze all settlement activity. Rafi Eitan, minister for Jerusalem affairs, said Israel had never promised to stop building within Jerusalem and had a duty to house its citizens. It is budgeting to build 500 new homes in Har Homa and 240 in Maaleh Adumim. A Palestinian spokesman condemned the plans, accusing Israel of seeking to destroy renewed peace talks. The two sides agreed at a peace conference in Annapolis in the US in late November to revive the 2003 peace plan known as the roadmap. According to the plan, Israel must halt all settlement activity and the Palestinians must rein in militants. But soon after the conference, Israel announced a tender for 300 homes in Har Homa. 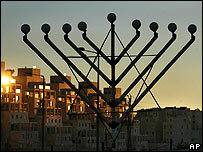 Israel annexed East Jerusalem after the 1967 Middle East War, a move not recognised internationally. News that the construction ministry was budgeting for 740 new settlement homes was reported by the Israeli settlement watchdog, Peace Now. The Israeli government has argued that the new homes in Har Homa are part of plans drawn up seven years ago, and that the area - known in Arabic as Abu Ghneim - was in any case not covered by the roadmap. Thousands of people live in Jewish settlements in East Jerusalem which are expected to remain in Israeli hands under any final peace settlement. Critics argue that the network of settlements will disrupt any future attempt to make East Jerusalem capital of a Palestinian state. 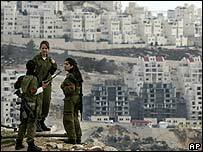 "Har Homa is an integral part of Jerusalem and Israel will not stop building there," Mr Eitan said on Israeli Army Radio on Sunday. "It is Israel's duty to provide its citizens with a place to live." Maaleh Adumim stands further out of the city but Mr Eitan insisted it was "an integral part of Jerusalem in any peace accord". Palestinian negotiator Saeb Erekat said Israel was undermining efforts to renew peacemaking. "This is a totally destructive policy," he said. "Every day we hear a new settlement expansion plan - this cannot be tolerated."